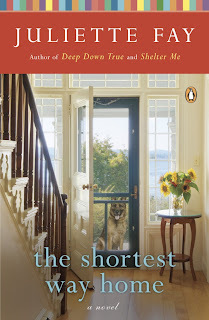 Today we welcome Juliette Fay and her latest novel, The Shortest Way Home. 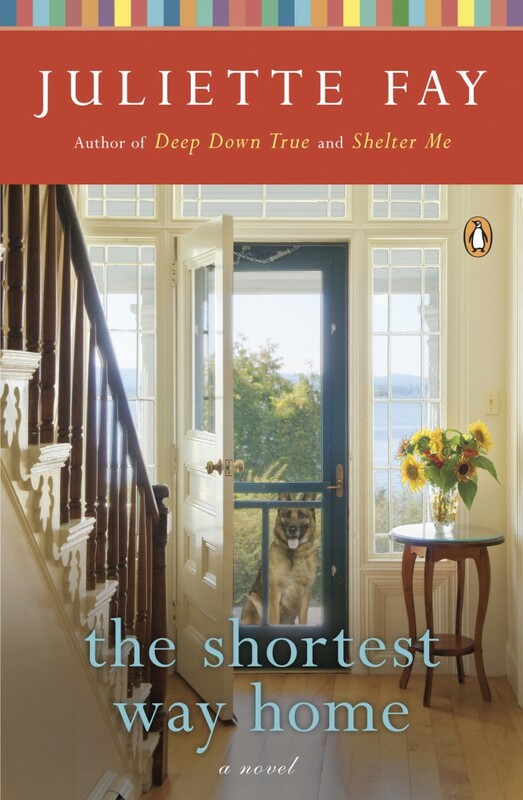 Juliette's won the 2009 Massachusetts Book Award Book of the Year for her first novel, Shelter Me. Her second novel, Deep Down True, was short-listed for the Women's Fiction Award by the American Library Association. 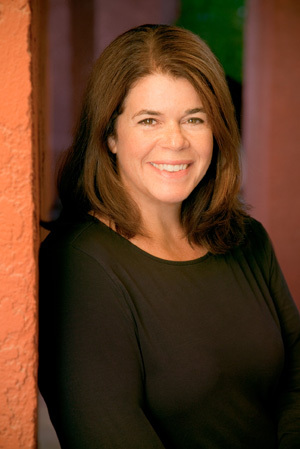 She received a bachelor's degree from Boston College and a master's degree from Harvard University. She lives in Massachusetts with her husband and four children. To learn more about Juliette, visit her website, Twitter and Facebook pages. Thanks to FSB Associates, we have two copies of The Shortest Way Home to give away to some lucky readers anywhere in the US and/or Canada. I have a book in the drawer. Okay, it's not in an actual drawer. It's in a box with old tax documentation under my fax/scanner. I also have electronic copies stashed in several places. Not that it matters. It will never see the light of day. Oh, Lord, have mercy on my wretchedness. I have been cast out into the wilderness of time wastage. And yet my toil has been for naught! Alas, my Book is in The Drawer. I wrote my drawer novel out of aggravation. I had just read a remarkably bad book. The only thing I liked about it was the premise: two people trapped in an elevator. (She was beautiful, he was handsome. Of course. Yawn.) I found myself wondering, What would I do with that for a starting point? Who would I put in that elevator? I decided that the man had just come from a family barbecue at which his siblings had skewered him for being selfish. The woman was a recovering alcoholic with an unmedicated anxiety disorder. The elevator got stuck between floors during a power outage, and the woman had a panic attack and peed her pants. I called it The Hyperventilating Pants-Wetter Society. It took me a year to write. In the end, the best thing about it was the title, which I still really love. I was in a state of ocean-floor level misery until I remembered how much I truly loathed and was slightly afraid of the both of them. Also, in the year that I had been trying desperately to get an agent, then waiting for them to find a publisher, I had written another novel, Shelter Me, and I knew it was better than The Hyperventilating Pants-Wetter Society, except for the title, which, let's face it, is hard to beat. Shelter Me was soon repped by Theresa Park of The Park Literary Group, my second -- and as far as I'm concerned, final -- agent, whom I love. After she got Shelter Me sold to HarperCollins, I asked her to read The Hyperventilating Pants-Wetter Society. She was not enthusiastic -- didn't even think it could be fixed -- so I left it in The Drawer (so to speak) and turned my efforts toward the new story I was working on which became Deep Down True. 1. That I completed it. Before that I truly had no idea if I could take a story from the bunch of stray thoughts to a full-length novel with a recognizable beginning, middle and end. It allowed me to put an official check mark next to something I'd always had on my bucket list: write a novel. Not write a bestseller or even get published. Just put the words on paper from start to finish. 2. That it's in The Drawer. For a while I had a hard time with the fact that I'd spent an entire year writing something that would never see the light of day. After I finishedDeep Down True, I went back to see if I couldn't -- oh, how foolishly -- prove my agent wrong by buffing it to a publishable state. I couldn't. It was not good. And if it had been published, I would be embarrassed by it now. It was a practice novel, pure and simple. The third reason is a little surprising. My father read and loved The Hyperventilating Pants-Wetter Society when I first wrote it. Along with being an adoring and completely biased parent, he's also a psychologist who often sees clients with phobias. A couple of months ago, he was helping a client with incapacitating claustrophobia -- especially in elevators. Her father was very ill and being treated on the twelfth floor of Massachusetts General Hospital. She desperately wanted to visit him, but not being in great health herself, she couldn't walk up twelve floors. My father went with her to help her get through the elevator ride. As they waited on the ground floor, she became terribly anxious, and he thought she might not be able to visit her dad. He later told me, "I wanted to distract her, so I started telling the story of The Hyperventilating Pants-Wetter Society. By the time the elevator came she was laughing, so I kept going. When we got to the twelfth floor she couldn't believe the ride was over so fast." Thus, 3. That it helped someone. You could look at a book in a drawer as a year's worth of work for nothing, and in some sense you'd be right. But when I remember that mine also helped an ailing man get a visit from his daughter, my frustration is reduced to almost nothing. Thanks to Juliette for enlightening and inspiring everyone and to FSB Associates for sharing The Shortest Way Home with our readers. Tell us about something you keep hidden away but can't bear to throw out (a story, an old letter, something from your school years, etc.). I have a box of letters my mom wrote to me through the years. She lived in Australia and passed away in 2004. I sometimes read them because they were full of humor, she was very funny. I keep all my old lyric sheets. Even though I'm not singing any of those songs with a band anymore I just can't part with them. I still keep a friendship bracelet from my best friend in grade school. I have Regis Philbin's autograph and I will never get rid of it! i still have the shirt I wore on my first date with my husband. I will never fit into again, yet I cant get rid of it! I have a box of letters from my mother and father to each other during World War II in an old leather suitcase. Gross I know - my baby teeth. My mom kept them and gave them to me when I was an adult. I have no use for them but can't throw them away either. That and positive pregnancy tests - again - gross, I know. The first ring my husband gave me just plastic but it was first freinship ring soon replaced by engagement. Ring this time the real thing.Lomazowr@gmail.com. I still have a clip of my baby's hair that my mother saved and gave to me when I became an adult. Not hidden and something I can't throw away. I've kept many correspondences from old boyfriends just because they were good writers. Unfortunately, I gave away precious letters from one old boyfriend because I sensed my husband's jealousy---wished I still had them. I keep a plastic charm from my biggest crush in college. We were good friends but I always wanted more. My sorority pledge book and letters from my mom while I was in college (before internet and long distance phone calls were expensive!). OOPS forgot ....my email is videoclimber(at)yahoo(dot)com...Sorry! I have a baby shirt from 1985 with my name on the back of it. I was a small baby so it's tiny. I also have a cabbage patch doll that I refuse to get rid of. Tried to once and couldn't do it! I have a stack of old letters that my husband wrote to me while he was in the army and sent to far away places, that I can't bare to throw away. I have had some of them for 33 years. Thanks for having the giveaway. I keep a couple of letters I wrote to my children the first time I left them for an extended time. I have all the little notes and drawings that I got from my husband when we were dating. I am pretty sure if I showed them to our children, they would be surprised to see that side of their dad. I have my grandmother's prayer book...a very special momentum from her. My baby blanket that my grandma made me. She passed away 24 years ago, and I plan to pass it on to my daughter, and hope that she passes it on to her children! I have all my old diaries from the time I was 17. I have some of my old baby clothes. Don't know what I'll ever do with them but I can't get rid of them!! I have old notes from friends from elementary school. I have a lot of my kids drawings and projects from when they were little but I need to pick only a few. My positive pregnancy tests (yuck, I know) and my baby bracelets/ID tags from the hospital. Hair from their first hair cuts too! I keep every bookmark I ever get, no matter how silly! I have an old stuffed McGruff the Crime Dog that was given to my daughter years ago by my grandmother before she died. My siblings/cousins and I played with it as kids and loved it. Even though it technically belongs to my daughter, I can't bare to let it out of my hands. I know I will pass it on to her later though when she is older and more able to appreciate it. In addition to my first Teddy Bear and my Raggedy Ann doll I had as a child, I also have the pink dress I wore on my first birthday. I have many pictures (black and white) from that day of my parents and me wearing the dress that it's nice to have the actual dress. I think it's what started my love of pink and all things girly. I have several of the things others have listed (school ribbons, bookmarks, Raggedy Ann, etc), but what I keep and can't bear to part with is my late husband's wallet. Of no earthy use to anyone, and it can't be wrested from my hands. I have far too many things hidden away. I wouldn`t say I am a packrat but I love mementos! I keep them in storage at my parents, kind of sad, no? Thanks to everyone for participating and sharing what is hidden in your drawers and closets. Lots of fun mementoes. The positive pregnancy tests stood out to me the most. I save my kids' old hearing aid ear molds, so talk about being sentimental! Congrats to Margaret Literary Chanteuse and pascale!